Being a home health RN is a rewarding, flexible position for nurses that allows for more time with patients, a diverse schedule, and more hands on opportunities when caring for patients. What is the outlook for home health professionals in 2019 and beyond? Who are the trendsetters in the space? Read on to learn more about the future of home health nursing. On a basic level, home health care is exactly what it implies: care that is brought to a patient in his or her home. However, the term encompasses a number of services provided by healthcare professionals, including skilled nursing care, physical therapy, speech therapy, and occupational therapy. It also can sometimes include skilled, non-medical care and daily living services from home health aides. Home health is sometimes associated with geriatric care, and it’s often incorrectly assumed that a nurse working in home health will simply be helping elderly patients who are struggling with dementia or other ailments. In fact, home health nurses treat patients ranging from the elderly and mentally ill to patients recovering from surgery or struggling with diabetes or congestive heart failure. Unlike an RN in a hospital setting who will face various challenges within their specialty, the situations home health nurses will encounter can vary wildly and will require skills across specialties. A typical day might include checking vitals, cleaning wounds, administering medication, and drawing blood. Other situations may range from taking care of minor issues to ones where critical care responses are necessary. Additionally, a home health nurse can serve as an educator, since he or she may have to instruct a new patient about lifestyle changes after being diagnosed with diabetes, or educate family members about how to care for an elderly relative after a fall. Most home health nurses are part of a larger agency, who will assign them patients and a route. Others may work for a skilled nursing or other facility and have home care as part of their duties. Choosing the right agency is essential, as each has their own culture and training. Not only are these companies consistently rated as having the best working conditions, they are also among the largest organizations in home health care. However, it’s important to consider the pros and cons of each agency before making the decision to work at one of them, and as not every agency is in every state, the possibility of working at one of these companies may not be available to every nurse. What Does the Future of Home Health Care Look Like? Since home health is one of the fastest growing medical specialties, the future of the profession is bright for nurses. New policy shifts and the adoption of AI and other medical technology has also made significant changes in the field that will likely allow for more growth and expansion. Where Have Recent Political Changes Impacted Home Health Care Policy? Medicare is the largest payer of home care services, but it has strict rules and coverage criteria for home care services. Each of the services under Medicare has a defined scope and specific types of care that are covered. One of the areas that is used often in home care is therapy. In 2018, the Bipartisan Budget Act removed existing therapy caps for physical, occupational, and speech therapy. The result is that elderly patients may not have to pay high out-of-pocket costs for these services, and agencies may find themselves in need of more therapists to cover these services. Additionally, the act includes expansions to existing Medicare coverage, meaning that more patients would be able to benefit from the services offered. These changes come as more people in the U.S. are making use of Medicare and Medicaid than ever before. As the population ages, these services will continue to be in high demand. How Does the Aging Population Affect Home Health Care? Further, the Baby Boomer generation has higher rates of obesity and diabetes than previous generations, and 88% of people 65 and older have at least one chronic condition. Luckily, there are more options for care than ever before, and healthcare is becoming more affordable for those who need to rely on Medicare or Medicaid, especially in the home health arena. The rising need for in-home care has inevitably led to a rise in opportunities for home health nurses. Nurse Journal reports that, “The BLS predicts a growth rate of 19 to 26 percent over the coming decade, which is much faster than the growth rate of other positions within the medical community and in other industries as well.” The rapid growth of jobs means that home health nurses have the opportunity to explore more options when it comes to where they want to work and when. Strategies like this are also combined with sophisticated AI technology that analyzes patient data and sends alerts to nurses for immediate response. Amedisys has adopted this technology, as have others. Additionally, services like HomeBridge identify potential issues or gaps in care that help companies identify the right post-acute care and prevent rehospitalization. Other companies thriving in the home health space include those who provide transitional care and case management services. Making the transition from the hospital to home care or to a nursing home requires the use of an organization and technology. Pioneers like naviHealth are establishing themselves in this field to help facilitate transitions and prevent hospital readmission. Further, other companies like citra health solutions are embracing telemedicine to bring transitional care services to patients and their families. Further, other technology like remote monitoring (which uses digital tools to collect health data from patients) is helping the home health industry do their jobs better and faster. With recent legislature introduced to include costs of remote patient monitoring under Medicare, home health is able to adopt more new technology to make it easier for patients to get the care they need. Having a career in home health means having a nursing job where no two days are the same. Here's what you need to thrive in home health. To work in home health, a nurse is required to have the same certifications as any other RN specialty. This means at least an ASN in nursing, although a BSN is often preferred, and the nurse will also need to pass the NCLEX. Additionally, a nurse will likely need a license to practice in the state where he or she is working, and in some cases, additional exams through the board of Home Healthcare Nursing must also be passed. Another consideration in home health is obtaining a compact license. A compact license allows nurses to practice across state lines. This can be invaluable for home health nurses who may need to practice across state lines. While this practice is incredibly rare, compact licensing is also helpful for home health nurses who want to pursue travel nursing, or who may be interested in taking various contract roles. One of the critical components to become a home health nurse is a deep understanding of emergency life-saving skills, as often the nurse may be the only person around to provide these procedures to a patient. In order to thrive as a home health nurse, you’ll need to be able to work independently, and to have a good handle on charting and documentation. The ability to quickly and accurately document patient interactions is key to finding success. Typically, home health nurses are more experienced, and many transition to home health later in their careers. Often (especially in rural areas) the home health nurse may be the only health professional a patient may see, so it’s critical that these nurses not only be able to keep track of everything, they also need to be able to think on their feet and problem solve. In her article in Nursing magazine, Brenda Elliott, PHD, RN, writes, “nurses in this setting must be skillful at detecting early signs and symptoms of decompensation and act quickly to keep a patient stable. Sometimes this means advocating for a change in medication regimen or a primary care appointment within 24 to 48 hours.” This is where experience greatly benefits home health nurses. Experiencing a range of issues with patients previously will better prepare anyone looking to move to home health for any eventuality. Finally, great communication skills are essential for home health nurses. In this position, a nurse may need to communicate changes in care or medication not just to the patient, but also to families or other healthcare professionals. A nurse may also need to communicate with case managers, or if a patient is older, a skilled nursing or other facility. Having excellent communication skills can help a nurse to navigate a number of relationships, and can help to educate patients and their family to help them make more informed decisions about the type of care needed. Home health has the greatest flexibility of any nursing specialty, but it’s not without its challenges. The nature of the job itself means that it can be very difficult to learn, and many nurses must work in the field for at least a year or two in order to feel comfortable. One of the primary issues home health nurses face is the amount of required documentation. Some of the charting systems can be challenging to learn, and it can take much longer than typical charting. This is primarily because home health is far more independent, so nurses must be incredibly meticulous when documenting their time with patients. Another related challenge is organization. 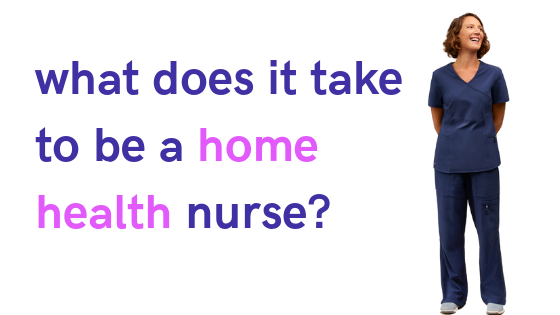 While home health is often preferred for its flexibility, some nurses find it difficult to manage their time and complete all their work and visits within eight hours. Additionally, some home health nurses may have to work in areas that present safety risks, or that aren’t clean. It’s important to work in a position or with an agency that prioritizes nurse safety. While home health is in itself a specialty, having worked previously in med/surg or in critical care can be immensely helpful. This is largely because these specialties provide nurses with a wide range of assessment skills. There are a number of ways to find a job in home health. First, consider whether your preference is full-time, contract, or per diem. Working a contract position in home health can be a benefit if you’re unsure about whether home health is for you. Per diem nursing is somewhat different from contract nursing, as it is literally pay-per-day. Nurses who choose this option may work a few days in home health, and then a few days at another facility. 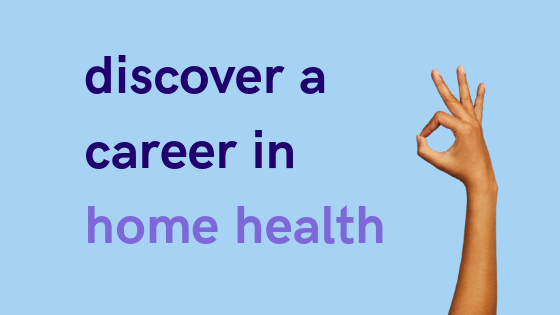 If you’re interested in pursuing a career in home health, you can browse open home health positions on the Relode platform here.